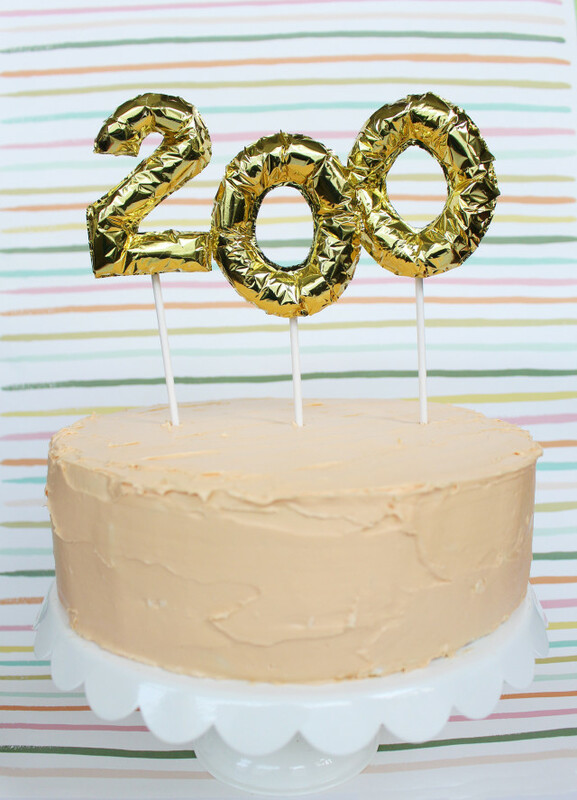 And just like that we’re already at our 200th post!! We already feel like we’ve had so many awesome opportunities through this blog and learned so much! Malissa and I are still learning and growing and improving everyday and we’re so thankful that we have this platform to share that growth on and to force us to make those efforts. It takes creativity to have creativity and setting these goals for ourselves keeps us on our creative toes and makes it so much fun! Thank you for joining us here in this place that we love so much! As a special celebration, I wanted to post this craft that I have been working on for several weeks. 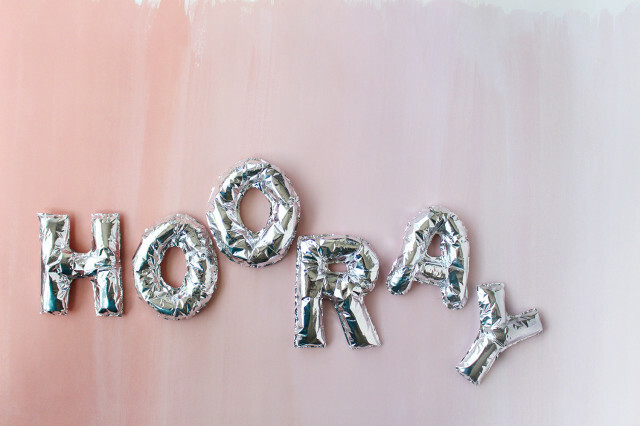 DIY mini foil letter balloons! 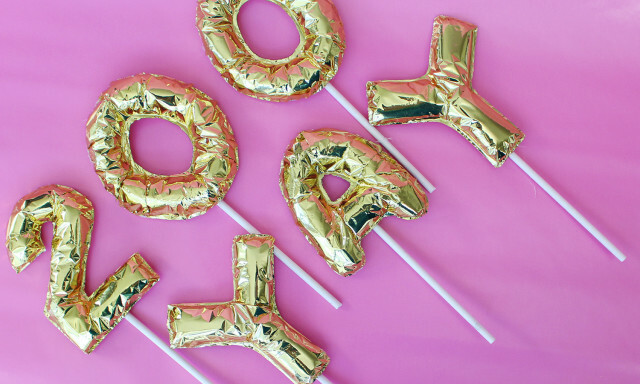 I thought about this a couple months ago and thought there couldn’t be anything better than teeny tiny versions of those awesome giant mylar letter balloons that have been making the rounds in just about every party this year. I have to say that when Urban Outfitters released their holiday collection featuring these mini letter balloon ornaments I was a little disappointed. Obviously I love them! But I felt like it might’ve stolen my thunder for this DIY I was planning. But then I realized, their letters are $6 each AND there is no U-Z. That makes so many words un-doable! (Um hello…yay, hooray, fun, happy, love..so many more!) 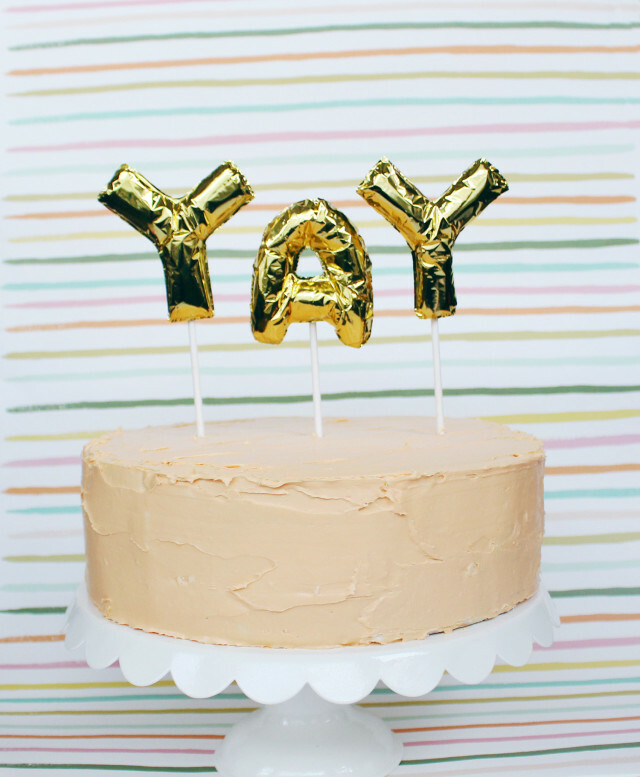 And those are just the words you’d wanna use if you were making them into cake toppers! So I continued to perfect my method because you need to have access to whatever letter (or number!) you want and this version will only cost you like…10 cents a letter maybe…and you guys love DIY right!? Duh! The title is kind of a lie because these aren’t really mylar and they aren’t really balloons either but they are mini mini (because mini versions of these balloons already exist in the world) and they are DIY and they are probably the best thing ever because they’re not pop-able, they’re not expensive, they’re reusable and personalizable and just all around fabulous! So let’s show you how it’s really done! We want these to have the puffiness look of a balloon so we’re going to fill them with cotton. The regular balloons have a visible seam around the edges so we’re going to create that look too by gluing around the cotton swabs. Look up pictures on the internet of letter balloons if you want a reference for how your letters should look. 1. 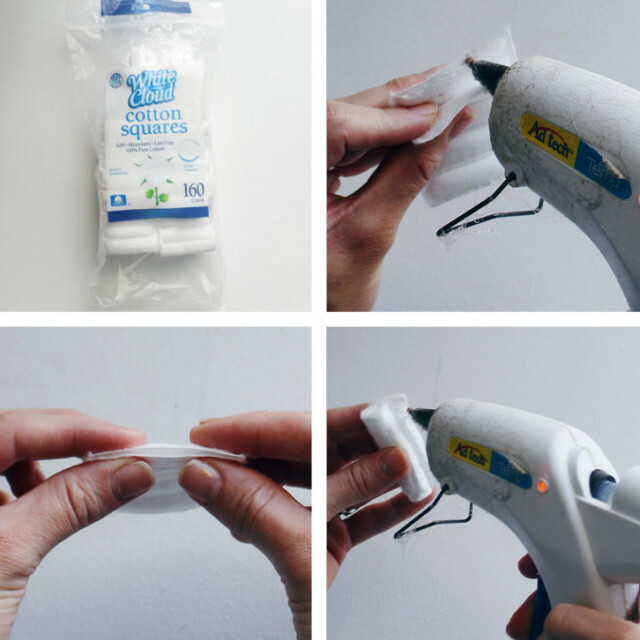 Take your cotton squares and glue two together by dabbing some glue between them at one end. Then roll inward from the other end and glue them shut so you have a bunch of little cylinders. For some of the letters you’ll need half a cylinder or maybe even less. 2. 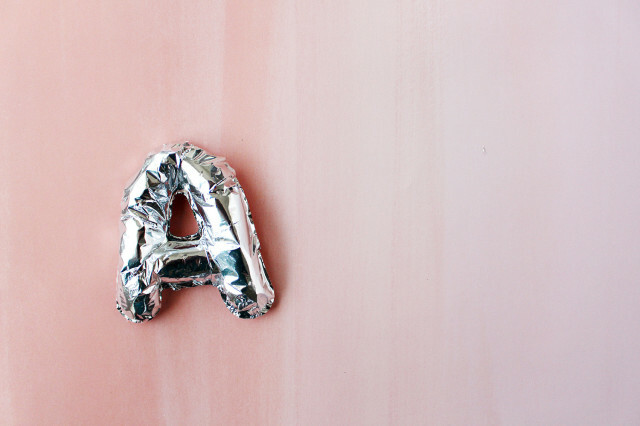 Start forming your letters on the under side of your foil wrap. Sometimes drawing the outline of the letter out first is helpful. I would glue down the first cotton swab and then glue then next one to the end of that first one, wait for it to dry and then glue it around where it should go and, if applicable, attach it to the other swab it meets up with. 3. Use glue around all the edges so your cotton is immovable for when you’re coving it up. Here are several pictures showing my insides of my letters so you can kind of see how I formed some of them. Most my letters were about 1 1/2 cotton swabs in height. 4. 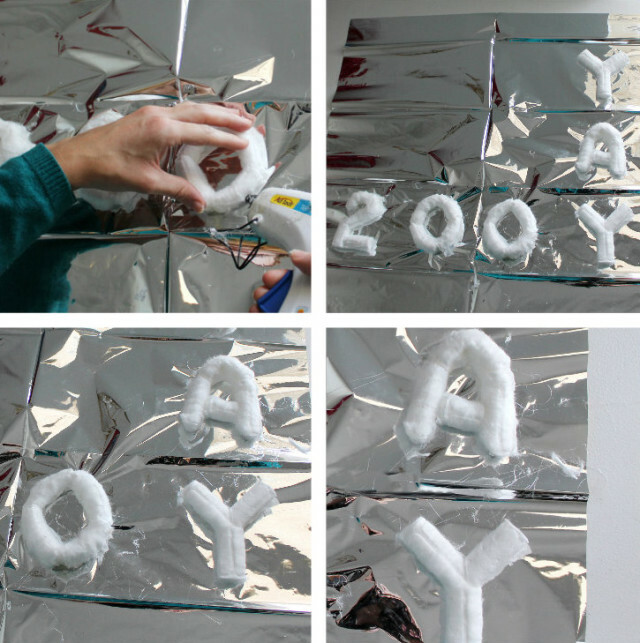 Use hot glue around the letters to adhere the top layer of foil to them. 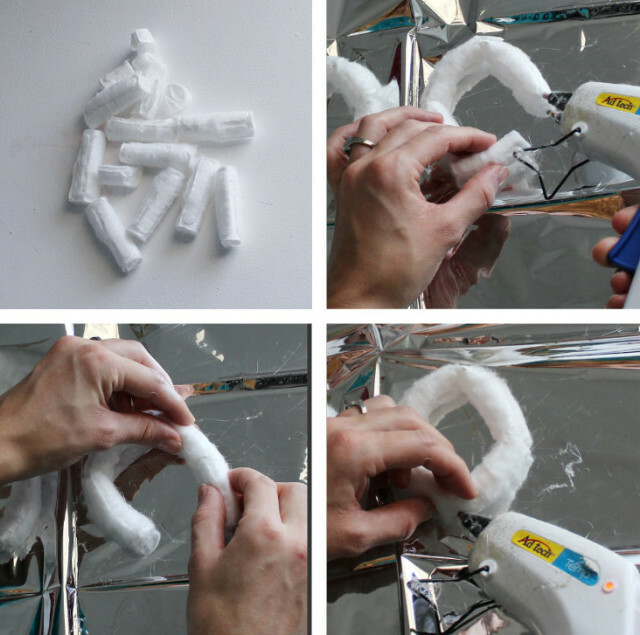 Start from the inside of the letter and just do small sections at a time being sure to pull your foil and tightly over your cotton as possible. 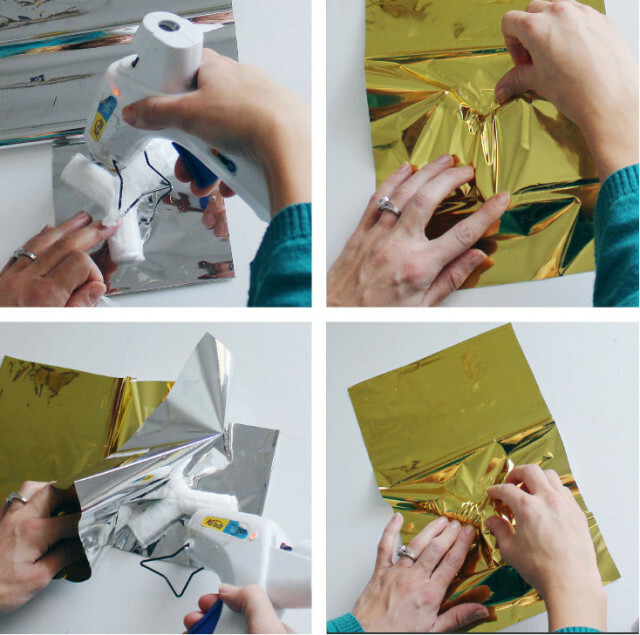 Be sure to press down through the foil as well, you want your glue to be pressed as flat as possible not left to dry in a lump. 5. Now you can cut them out. Cut closely to the letter using scissors, xacto knives (btw I just won an awesome set from DIY Lifestyle Mag thankyouverymuch! ), whatever tools or skills you have available to you to do this. Slow and steady, especially for those fragile little insides. 6. Then you can attach sucker sticks to the back bottom of them and use them as cake toppers, cupcake picks, in flower arrangements, just poking out of your pencil jars, wherever!! See it really was pretty simple right?! I think these turned out just as cute as they could have and I wouldn’t be surprised if you start seeing them in every single cake I bake and featured somewhere in every single party I throw! I’m pretty sure I’ll start incorporating them in to my interior design as well. Stella needs her name in mini foil balloons sitting atop a shelf or hanging on the wall right? And again, Malissa and I couldn’t love this little space of ours more, thank YOU for helping keep us motivated to reach 200 posts in 9 months! Here’s to the next 200! Oh, these are the cutest things ever!! Thank you so much for figuring this out for all of us!! Oh my gosh you’re so nice Marianna! These are so adorable! I think they would be great for a New Year’s Eve party. Oh my goodness…..these are just too stinking cute! Gahhhh, I love them! I know I’ll have to make some of these in my future. Thanks for the great tutorial. Definitely pinning this and sharing it on Facebook as well….bravo! Oh my you are so nice Christine!! I’m so glad you like them!! Wow! Just pinned this from Pinterest! And I have to say these are the cutest things ever! Thank you so much Lexi!!! Love this! Just wondering, is there an alternative method if you don’t have hot glue and glue gun? Yes! You can sew it! I would apply some kind of glue (glue stick preferably) and stick the cotton to that, then sew around it and cut off excess. If you don’t have access to a sewing machine, you could try another glue like tacky glue maybe and just allow it to dry fully before cutting. Oh my gosh these are adorable and awesome, I can’t wait to make them! Thanks for the super detailed tutorial! Of course Mandisa!! Let us know if you do make them, would love to see how they turn out!! I searched and searched and could not find mini-enough balloon letter; and then found this article. OMG! Cheap, easy, and fun. So glad you found it Toni!! These are super cute!!! My friend found this tutorial and made some letters to celebrate my friend’s birthday. They turned out so cute!! Here’s a link to see what he made. Thanks so much for sharing that with us Elmo! I love seeing the fantastic items people make following our tutorial. Why don’t you just use the round dental cotton rolls that every dentist uses then you would not have to roll them up and they are easy to cut in half?? Yes that was actually my original idea! The reason I didn’t use them is because I couldn’t find them to buy anywhere, I looked at every store I went to for like a month! I’m sure they’re online but this worked just fine, so I didn’t bother to do that extra research. Feel free to use them in your crafting! Brilliant! Can’t wait to try & make these! !